NAILED IT CLASS OR BY MAIL! I think the Nailed It Bundle in the Occasions Catalogue has been very popular for those hard to make Male cards. 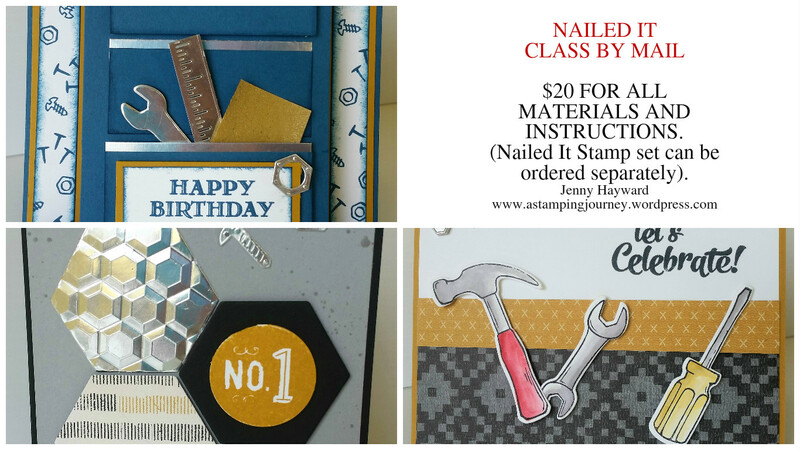 This Saturday in Card Class we will be focusing on this Bundle to make some cool manly cards. If you can’t make it you can take the Class by Mail option. Here are the details for you. COST: $20 (extra $5 to use my adhesives). Please RSVP by Thursday 16th March. Book early to reserve your seat. Get the Class by Mail. Includes card, paper and embellishments Plus step by step instructions. Stamp set not included. You can order the Nailed It Bundle separately or substitute with a different set. Order the Nailed It Bundle separately. I hope if you are in the Wollongong area you can come along. If not, consider getting the Class By Mail option. ONE FOR THE BIRTHDAY BOY AND ONE FOR THE PARENTS!!! It was one of our Great-Nephews 4th Birthday on Sunday. Now, I had to make a card for the special Birthday boy. Since his Pop owns some property and is always driving his tractor around, I thought a tractor card would go down well!!! I have used a number of different punches to put this tractor together: 1 3/4″ scallop circle, 1 3/4″ circle, 1″ circle, 3/4″ circle, word window plus the cupcake punch for the clouds. The rectangles for the body of the tractor were 1″x2″. I used 3 of these and joined together and 1 that size for the trailer. The ‘4’ was cut with the Timeless Type Alphabet/numbers die. I realised when I took the photo that the wheels were a bit uneven. Too late to change it. I don’t think a 4 year old would be worried – would he???? His parents have recently become engaged, which we were really pleased to hear. So I made them a card to celebrate. It might not be your typical engagement card but I think it suited them. This card was inspired by a card I saw some time ago on the blogosphere and I can’t remember who by now. I think it is a cute card to celebrate the special event.